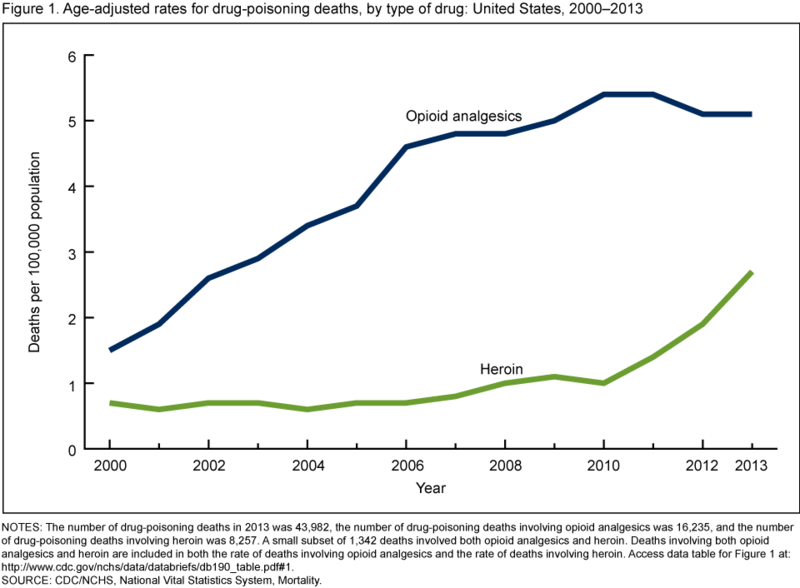 The rate of drug overdose deaths involving heroin increased slightly during 2006–2010 but more than tripled during 2010–2015 for all age groups shown. During 2010–2015, the rates increased from 1.2 to 3.8 per 100,000 for persons aged 15–24 years, from 2.2 to 9.7 for persons aged 25–34 years, from 1.6 to 7.4 for persons aged 35–44 years, from 1.4 to 5.6 for persons aged 45–54 years, and from 0.7 to 3.4 for persons aged 55–64 years. In 2015, the rate of drug overdose deaths involving heroin was highest for persons aged 25–34.